When an application needs to start a protected service with SDL core the app sends a certificate to SDL during the TLS or DTLS handshake process. In order to validate the certificate and to check whether this certificate is not expired SDL core needs an accurate UTC system time value. 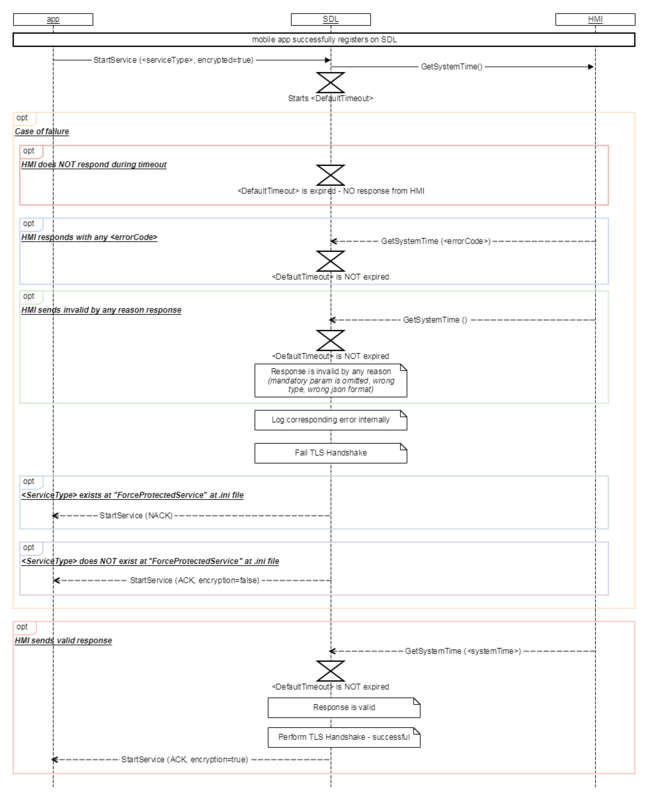 SDL sends a GetSystemTime request after receiving a BC.OnSystemTimeReady notification from the HMI. After sending the request SDL starts <DefaultTimeout> (value from .ini file) waiting for response from HMI. Provide all parameters of the "DateTime" struct inside of the GetSystemTime response. If the handshake process fails, SDL behavior depends on the "ForceProtectedService"/"ForceUnprotectedService" params configured in the 'Security Manager' section of the smartDeviceLink.ini file.